Melissa Marr’s first novel for adults (she’s better known for her YA novel series Wicked Lovely) was my first read in 2012. Actually I started Graveminder in 2011 and was hoping to get it finished but I just couldn’t manage it. Graveminder was recently voted Best Horror novel at Goodreads, but it’s been on my radar for a few months and I was really looking forward to reading it. 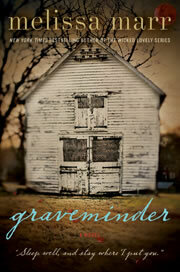 The premise of Graveminder is actually quite intriguing. When Rebekkah Barrow’s grandmother, Maylene, is murdered, Rebekkah comes back to the town where she grew up. Claysville is not like other towns; it has strange traditions, particularly where the dead are concerned. If anything happens to me, you mind her grave and mine the first three months. Just like when you go with me, you take care of the graves. …Promise me. Rebekkah, as it turns out, is a graveminder, too. Her job – which she knows nothing about until she returns to Claysville, is to guard the graves of the dead. Her return to Claysville is complicated by her on again off again relationship with Byron, the town’s undertaker. (Graveminder, undertaker – sounds like a couple wresters,eh?) Byron was Rebekkah’s sister’s high school sweetheart until tragedy struck and now Rebekkah just can’t seem to get it together where Byron’s concerned. These unresolved feelings make up a large part of the novel’s energy – but not in a good way. None of Graveminder actually lives up to the promise of the plot. The writing is generally clunky, the characters vacillate between annoying and insipid and many promising plot threads are never satisfactorily resolved. Rebekkah continually pushes Byron away and they have the same conversation over and over – like they are 12 – drove me c-r-a-z-y. Their interaction was not adult in any way. Graveminder wasn’t scary, either. The premise was: the dead must be tended or maybe they’ll come back and if they do – watch out. Also, Marr has created an intriguing ‘other’ world, a place where the dead go and live. The thing is, it feels like she’s dropping the reader into the middle of a story – where questions are asked but never answered. If there’s a sequel coming, I won’t be reading. This entry was posted in 365 Days 2012, Book Chat and tagged 2012, Book Review, horror, really disappointing books by Christie. Bookmark the permalink.